Visit Our Locally Owned Drug Store Today! Let Us Be YOUR Local Pharmacy in the Duncan, Wellford, and Lyman, SC Community! Lyman Drug Inc is your locally owned drug store in Lyman, SC that has been serving the Duncan, Lyman and Wellford communities since 1926. Richard High, a native of this area and graduate of Byrnes High School, is a licensed pharmacist that has owned and operated our drive thru drug store since 2005. You may wonder how a small drug store such as this would have remained in business for nearly a century, and the answer is quite simple: we make our customers feel like family. We are confident that we can meet your prescription needs quickly and easily. There are no long waits or lines to contend with. Just as importantly, while we won’t ever lose our old-fashioned values of attentive service and friendliness, we know how to change with the times. We encourage our customers to take advantage of our drive thru pharmacy on those days when they’re running dozens of errands and simply don’t have time to park the car and come inside. We even offer pharmacy delivery for people who have trouble getting to the pharmacy. When you are looking for a locally owned drug store in the Lyman, SC area, offering prescription delivery services and more, rely on Lyman Drug Inc. What other drug store in the area will give you the convenience of pharmacy delivery? Call us or head to our drive thru drug store today! We Offer a Pharmacy Delivery Service! For your added convenience, our local pharmacy in Lyman, SC offers a drive thru window to make dropping off and picking up your prescriptions hassle free. That's not all! Besides being a drive thru drug store, we also offer a prescription delivery service to customers who live within the District 5 community. We have a "$Dollar Deals" section full of different items for only $1 – and so much more! While we encourage you to take advantage of our drive thru pharmacy when you’re in a hurry, we absolutely make it worth your while to come inside every now and then. Our shelves are stocked with a wide array of home health care solutions, including mobility aids, over-the-counter medications, and much more. We also carry a line of Burt's Bees products like the classic lip balm, lip glosses, and even hand and foot care products. Need a gift or card for a special occasion? While shopping with us, be sure to check out our variety of cards priced as low as 99 cents as well as our special gift items. We make it easy to stock up on cards for birthdays, anniversaries, Mother’s Day and Father’s Day, Valentine’s Day, and the holidays. Plus, our array of special gift items enables you to easily find a thoughtful gift for any occasion. If you need help picking something out, just ask our staff! 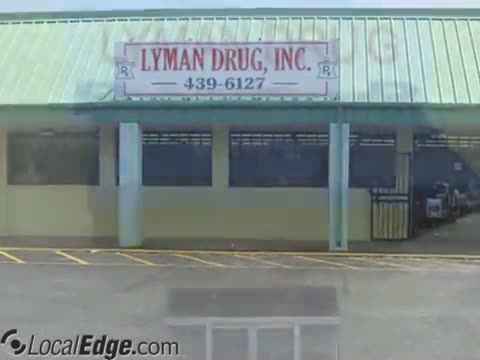 At Lyman Drug Inc, your prescriptions will be filled quickly by our pharmacy staff that you know and trust. Trust is everything when it comes to your local pharmacy. Whether you’re taking advantage of pharmacy delivery or coming to see us in person, know that our licensed pharmacists will take excellent care of you. We are always available if you have questions or if you want to learn more about the medications you’ve been prescribed. Put simply, we are a full service, locally owned drug store offering more than just prescription and over-the-counter drugs. We have friendly staff members, a huge selection of health and gift items, and the local service you know and trust! Call today to ask about our prescription delivery service and more, or simply come and pick up your prescriptions at our drive thru drug store in Lyman, SC today!